I think the essence of this quote frequently gets lost. It isn’t trying to urge you to drop everything you aren’t successful at, but merely to get you to focus on the present moment. If your mind is cluttered with your list of chores you need to get done throughout the day, or even the week, then chances are that you aren’t focusing on whatever task you are doing in the present moment. 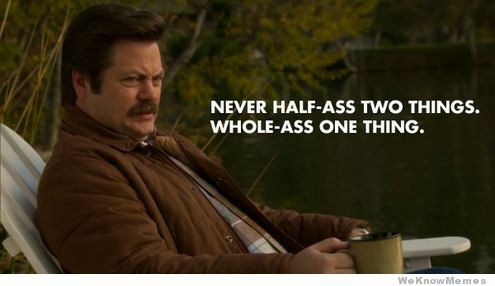 Less focus equals more half-assery. This concept goes hand-in-hand with other posts I have made in the past about working on your faults and never taking “no” for an answer. Just because you have many different interests, and things you like to do, doesn’t mean you need to choose between them. It simply means you need to put more of your attention, and thus effort, into the activity at hand. Stop cluttering your mind with other things that need to be done and enjoy the present…because that’s what it is, a gift.